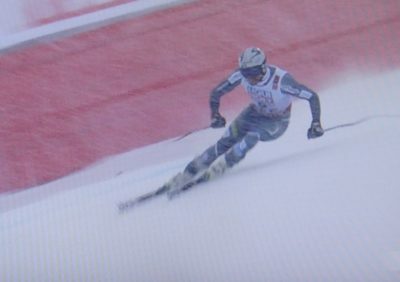 Maybe training with the Norwegian military’s special forces last spring helped downhill racer Kjetil Jansrud after all. He skied, at any rate, to the World Championship in the men’s downhill over the weekend, while his longtime mentor Aksel Lund Svindal skied to what could only be called a fabulous end to a brilliant career. Jansrud hasn’t had a very good season in the World Cup so far, so his performance at the World Championships on Saturday left commentators and fans screaming with jubilation. Skiing at speeds of nearly 130kph (78mph) in fog and snow, his time of one minute, 19.98 seconds beat everyone else, but only by two-hundreths of a second over the man he’s trained with and shared a room on the World Cup circuit with for years. Svindal, retiring at an age of 36, crossed the finish line with a time of one minute 20 seconds exactly, robbing him of his sixth career gold medal in the World Championships but handing him a well-deserved silver after he skied his last race in professional competition. He came as close as he possibly could to ending his career on top, while he and Jansrud gave Norway a double victory that both said brought new meaning to their national anthem as they sang along with all the Norwegian fans in attendance. “The king abdicates, long live the king,” is how newspaper Aftenposten headlined its coverage of Norway’s latest skiing sensation. Jansrud has long been seen as Svindal’s heir to the throne of the men’s alpine sport in Norway, but he’d had a disappointing season up to this weekend. 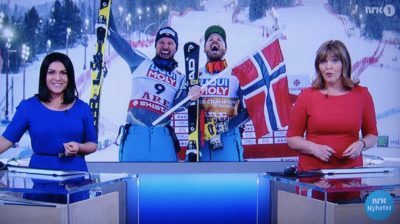 He told state broadcaster NRK himself in a pre-race interview that he actually thought Svindal was the favourite, and there was no question Svindal would do whatever he could to win gold himself. Neither had done well in the Super-G earlier in the week, with Svindal 16th and Jansrud 22nd. Jansrud was clearly determined to win himself, and showed, as commentator and former World Champion and Olympic legend Kjetil André Aamodt said, just how quickly things could turn around for Jansud. Injury and other setbacks have left him far behind expected World Cup results but newspaper Dagens Næringsliv (DN) reported last May how Jansrud and other members of the Norwegian men’s alpine team (including Alexander Aamodt Kilde and Henrik Kristoffersen) had trained with special forces to hone quick responses and learn to be on both the offense and defense. They were taught how to respond when under attack, develop a team feeling and, not least, experience both physical and psychological mastering of huge challenges in which special forces don’t always get a second chance. Jansrud may have realized he’d never have another chance to beat Svindal again, or, at the age of 33 himself, win another World Championship. He stepped on the gas and powered down the slopes, not long after having to simply hang out and kill time with teammates when the race was delayed by an hour because of fog and bad weather. Svindal even posed for selfies with admiring rivals, less than an hour before setting off down the mountainside. Jansrud and others, including Kilde, had made it clear before the World Championships even began that they wouldn’t cut Svindal any slack, or let him win gold on the last race of he professional career. “That would have gone against everything we stand for,” Jansrud told NRK. Kilde had said he wished Svindal “all the best, but this is a competition.” He ended up placing eighth in the men’s downhill. 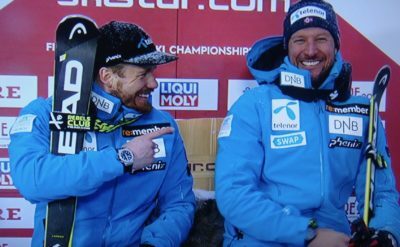 Congratulations were streaming in to both Jansrud and Svindal even before the race was over, with Svindal himself thrilled for both Jansrud and himself. “This is fun!” he exclaimed at one point, as he also was full of praise for Jansrud. The two were constantly pointing to each other on the winners’ platform and during media interviews afterwards, leaders of a mutual admiration society almost without parallel. Everyone else was admiring both, too, not least third-place winner Vincent Kreichmayr of Austria, who finished with a time of 1.20.31 and was happy just to be on the podium with the two Norwegians. Svindal attracted compliments from even his greatest rivals, and a standing ovation at the international press conference after the race. Asked why Svindal has always been so “he always has shown he cares about others, is extremely professional, a great mentor for teammates, worked well with all the team’s support staff, spent time analyzing races and most often made good decisions.” He also made spectacular comebacks after equally spectacular falls. In other words, an all-around nice guy who’s also a sensational skier. “This is all just fantastic,” said the former champ Kjetil André Aamodt, who’s been on the podium a lot himself. 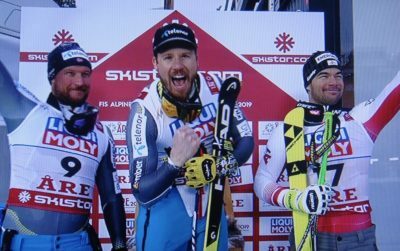 “We couldn’t have dreamed of a better finish.” At least for Svindal. The World Championships themselves continue through next weekend.